My series of the nominees of the election to become best cycling city of the Netherlands in 2014 is complete. But the five nominated municipalities were also portrayed by the Cyclists’ Union. These portraits were made to make the cities look their best, so it is perhaps nice to see these videos too. I translated each municipality’s motivation to participate in this election and the most important details as they were published on the nominee pages. Almere is the safest cycle city in the Netherlands. The city has a network of no less than 500 kilometres of cycle routes, for the most part separate and with an asphalt surface. Cycling on the main cycle network has priority (over motor traffic) and all crossings with main roads are grade separated. Nowhere can you cycle faster and more pleasant. Many hundreds of bridges and tunnels make Almere a city without barriers. The extensive nature reserve areas, the water and the wide range of high-profile architecture make recreational cycling in Almere an enjoyable experience. Why is Almere a cycle city? Cycling in Eindhoven is pleasant and it becomes increasingly better and nicer to cycle. Traditionally Eindhoven has had many obstacles for cycling, such as busy and wide roads and many (older) traffic light installations. There were many cycle paths with a surface of concrete tiles and there was a shortage of good bicycle parking facilities. One by one these obstacles are eliminated, or the situation was improved, with a strong focus on innovative cycle solutions. The new mobility vision “Eindhoven En Route” gives direction to a pleasant cycle climate. In short, Eindhoven transforms from a car city into city for cycling. Why is Eindhoven a cycle city? The love affair between Enschede and the bicycle has blossomed, the city again gives a considerable incentive to encourage cycling. With a prominent role for innovation, the quality level of future-proof facilities was raised, focusing on the use of bicycles for daily as well as for recreational purposes. Enschede has traditionally been a cycling city, with many cycle paths and good parking facilities. The city is proud of the rediscovery of these pearls for a sustainable and liveable city. Why is Enschede a cycle city? For many years, taking good care of the needs of cycling in the municipality of Velsen has been a matter of course. So many separated cycle paths have been constructed and cyclists encounter few obstacles in their way. There are only few traffic lights, many bollards have disappeared and the cycling infrastructure is being kept in excellent condition. The recreational cyclists are not forgotten either. Important recreational destinations have become well-connected to the cycling network. Why is Velsen a cycle city? Zwolle really is a city for cycling! Almost 50% of all journeys within the city, by residents, commuters and holiday makers, are undertaken by bicycle. Cycle routes have been paved with smooth asphalt and were designed as bicycle streets, wide cycle lanes or separated paths. They take the cyclists quickly and safely to their destinations. We are proud of our Hanseatic Arch, a high-speed cycle route and the cycle roundabout. In an innovative way we ensure that the rider can move forward in Zwolle. We do not do this on our own, we involve our residents in our bicycle projects. Why is Zwolle a cycle city? In exactly one month, on the 8th of May the winner will be announced. So which city has the best cards? Here are my thoughts. Zwolle is my winner. This city clearly displays it cares for its citizens who choose cycling as transportation, not only in words, but in actual measures in the streets. For quite some years the city has been building many brand new facilities of a very high quality and with innovative designs that work. That there is (still) a high number of older cycle lanes is unfortunate but the many new facilities outweigh this disadvantage. Eindhoven is a dangerous outsider. It too displays it cares for cycling by actually building (very) good new cycling facilities that at the same time discourage using the car. Hovenring draws most attention and is considered a “vanity piece” by some, but there are also great cycle streets, and many older cycle paths have been or are being repaved with smooth asphalt. On the other hand the city still has a lot of work to do: the car is still king on the city ring and there are many traffic lights that form barriers for cycling. So it may be a bit too soon for this title. Velsen is small but the state of maintenance of the facilities in this municipality is impressive. Unfortunately the North Sea Canal is a huge barrier and the municipality choose to build cycle tracks with a surface of concrete tiles and not asphalt. I must admit that I have not visited IJmuiden because I hadn’t realised it was part of Velsen (and I have since learned of some good facilities there) but I think that overall the infrastructure quality is not as good as that of Zwolle and Eindhoven. Enschede has been in the vanguard of cycling friendly cities. It was the birthplace of not only the “all directions green for cycling intersections” but also of the roundabouts with priority for cycling. But these innovations were long ago and the city seems to have been resting on its laurels in the last 15 to 20 years. The most recently built facilities are again of a very high quality but it is not yet enough to warrant the title in my opinion. Almere is in a league of its own when it comes to barrier free cycling. But having a completely separate cycle grid turned out to have major down sides as well. The social safety and the long distances in this city are really a problem. And so is the state of maintenance. Bad surfaces are a barrier too. Many surfaces in Almere are in an urgent need of an update and the plans reveal that they are not going to be resurfaced any time soon. The solutions the city chose to increase the feeling of social safety on new routes are not well executed and seem a step backward. To top it all off the city forces cyclists to dismount to cross a pedestrianized street in the city centre. That alone is reason for disqualification in my book. This new rail-road bridge has a cycle track along side of it. It is part of the high speed cycle route from Zwolle to Hattem. And why did I actually show you these cities at all? Isn’t this only interesting for the locals? I think not. It shows you that even in the country where cycling is generally thought important, there are huge regional differences. It is also good to learn what a competition like this does in a country. It makes municipalities think about their own policies when they are measured against other cities. This increases awareness about strong points and weaknesses and could spark better policies. 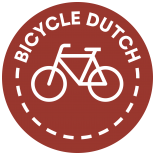 The competition also serves as a yard stick for what the Dutch themselves think is important to facilitate cycling at the moment. This whole concept may serve as an example for other countries to make different cities in a country more aware of their own potential and the state of their cycling climate. Amazing how the Dutch have such a big competition over something that is often not thought of much my most people. When people think of going somewhere, they think about it’s general direction, grab whatever they need and go. But the cities think of themselves so self-consiously that it really inspires me to advocate for even better facilities than what my city is probably going to present tomorrow about a bike route consultation that I am going to. I am probably going to need to tell them about the likely numerous problems with it. Possibly watering down the cycle track protection to paint and bollards/planters without a curb. Great list! Netherlands’ cycling infrastructure seems much better than in the UK or the US. There are some tips Netherlands can take from Denmark, though. Yeah!!! Seville is great for biking!!! The cycling network of Zwolle and Almere have an interesting resemblance and at the same time a large difference. In both cities the cycling network is separated from the car network. Which makes it nice, as you don’t need to cycling alongside big roads all the way. But in Zwolle the network leads through nice residential streets, through former villages (like Schelle, complete with farm houses! ), while in Almere it leads through parks and green belts. At daytime that’s nice, but there’s a huge feeling of unsafety when it’s dark and no one is out there. Nice post!!! Seville is perfect for bikes – it’s flat, has miles of bike lanes and so, surprisingly, nearly one-tenth of sevillanos chose to commute on two wheels. For me, there’s nothing more freeing than pedaling along the Guadalquivir. Good!! I hope not to discourage you, but in the Netherlands 10% would be extremely low. All these cities are probably above 30%, Zwolle is even above 50%. Rotterdam is considering to have a very low number of cyclists even in the city centre and it has 20 percent. If only my city had 20% of people on bikes everyday. 180 thousand. Though for the Dutch, that would be considering a small number. They would consider it normal for a city to have double that number, or likely more. Though my city alone without it’s metropolitan area is more than 100 more than Amsterdam, and would considered an extremely large city. 50 km in diameter. We have a fantastic red cycle network spreading all through the city and we have several large, guarded and free to use places to leave your bike behind. Also we are surrounded by great nature which can also be used to cycle in. Why was Groningen not included in this list? It is often cited as the most bike friendly place! There have been previous competitions in 1999, 2002, 2008 and 2011, and Groningen won the 2002 competition and was shortlisted in 2008 and 2011. This time they did not candidate. Perhaps the Fietsersbond gave them a sign that they would not let one of the previous winners (the others were Veenendaal, Houten and ‘s-Hertogenbosch) win again anyway. 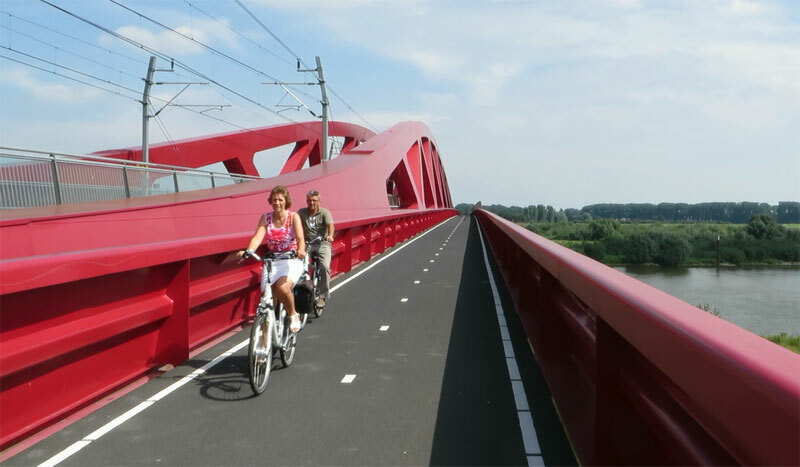 I especially appreciate the part near the end (~2:35) of the Almere video which shows a wielrenner cycling over the same bridge they’ve already shown several times in the video (are they that short on infrastructure? ), the text “Daarom is Almere een Fietsstad!” appearing, and the camera panning to show them going past .. a car parked on the cycle path. The bollards at 1:00 seem shockingly terrible too. Just, gosh, are the local fietsersbond chapter trying to make a not-too-subtle point rather than a supportive video? My guess is that car belongs to the man or woman who made the video! “Isn’t this only interesting for the locals?” gosh, no. It’s amazing to see that in the NL that this is a high-stakes competition between cities! I’ve been trying to fire up some useful competitiveness between councils in Australia. We should try and start up something like this, probably with a strong focus on ‘most improved’ city or council. I agree about that crossing in Almere. Disqualification. “A cycle facility which requires a cyclist to dismount is not a cycle facility” (ECF). This entry was posted on 9 April 2014 by Bicycle Dutch in Original posts and tagged Almere, Eindhoven, Enschede, Fietsstad, Velsen, Zwolle.